— from a personal diary. The recent Vancouver panel discussion on Naomi Klein’s new book, This Changes Everything , from which this article took form, was organized weeks before a local Blockadia event took place. By the time the five panelists came together, two had been arrested for defying a court injunction and two were named in a $5.6-million lawsuit for objecting to Kinder Morgan’s (KM) planned pipeline through a municipally designated park on Burnaby Mountain. The panelists were active supporters of a mountain camp that was established directly on top of the borehole-site where KM intended to do seismic testing. This article reviews Klein’s new book after, and in the light of exploring the context of the Burnaby Mountain incident in more detail. The Burnaby Mountain camp was defended by individuals that came to be known as the “caretakers,” led by several direct-action activists unaligned with any institutionalized group. What did seem to hold the caretakers together and attracted thousands of others into this stand-off was a certain warrior spirit, which appeared to be derived from two sources. One was a passion driven by existential attentiveness to fossil fuel driven climate crisis together with the impudence to take “inappropriate” personal action against KM, a perceived giant multinational fossil-fuel bully. 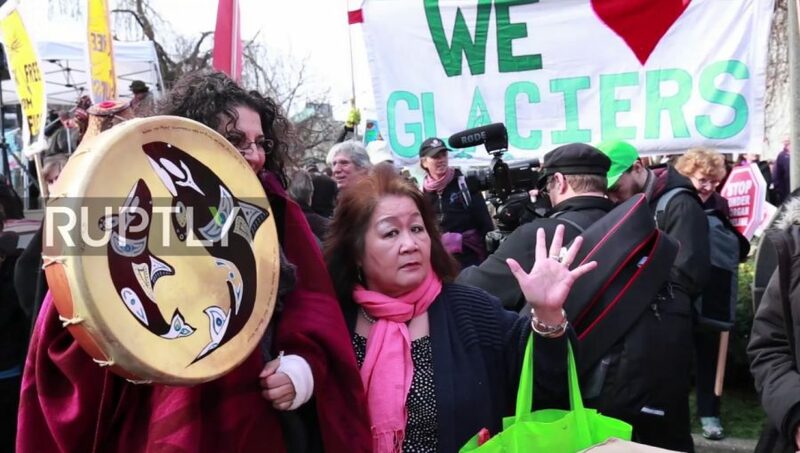 The second came from the deep connection of specific First Nations individuals to the responsibility of protecting territory against colonial incursions that subsequently inspired many more settlers to act in solidarity. One small, but nevertheless outspoken contingent was scientists and professors (academics) at Simon Fraser University (SFU) in whose backyard this stand-off was taking place. that issues concerning what amounted to the very survival of civilization were beyond the university’s “core institutional mandate.” He relied on the safety valve that was intended in the creation of the National Energy Board to say that the university respected the institutionalized opportunities for community input. He neglected to acknowledge the legitimacy of civil disobedience strategies in progressive societal change. Unfortunately, considering his expertise in anti-SLAPP legislation, Petter fell far short of fully defending his academic colleagues from the political-legal machinations of KM. When the call came from the caretakers and Indigenous leadership, many sincere individuals from multiple pre-existing neighbourhood organizations (notably, the Burnaby Residents Opposing Kinder Morgan Expansion), activist, student, socialist, anarchist, NGO, and environmental groups flooded the mountain. Unlike the great recent social upheavals in Quebec that have contributed to building broader social movements, however, there was no banner under which these multiple tendencies in BC were able to mobilize in a more coherent fashion on the ground, nor a strategic focus upon which to contribute to a sustained and cohesive political organization. Many other more established groups were unmoved by the opportunity to engage with new activists in the process of politicization. 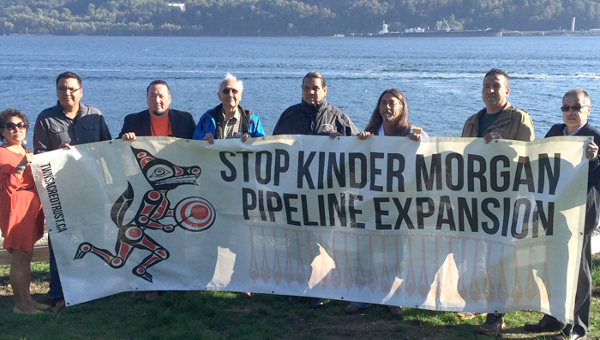 Kinder Morgan did accomplish much of what it came to do – the seismic testing in preparation for extending the Alberta tarsands pipeline through a municipal park on its way to Vancouver ports. It may be that all KM needs is an accumulation of these small tactical battles to complete the Trans-Canada pipeline, but their actions also drew out uncharacteristically animated, fierce and surprisingly creative community responses. The victorious mayors in two local elections enlarged their electoral constituencies by slamming KM’s actions. Activists inspired thousands of viral “KMFace” memes throughout social media among many other symbolic bullets against the deteriorating public image of KM. The National Energy Board was transparently exposed as an extension of the authoritarian concentration of the power of Harper’s PMO. In court, KM’s legal actions were ultimately understood as a misuse and manipulation of the court process. Kinder Morgan requested an injunction perimeter based on its own GPS readings, and then had the temerity to request a new injunction after providing the court with deficient calculations. The court refused KM’s request and dismissed over one hundred arrests that were premised on the faulty information. The five defendants named in the $5.6-million suit were also eventually released following KM’s unilateral discontinuance of the civil action. Time will tell if the SLAPP suit will have contributed to a dampening of activism, but in its immediate wake it seems to have had the opposite effect on its activist targets. The uncanny accumulation of activist “victories” in this Blockadia action produced a new crop of politicized and empowered activists. 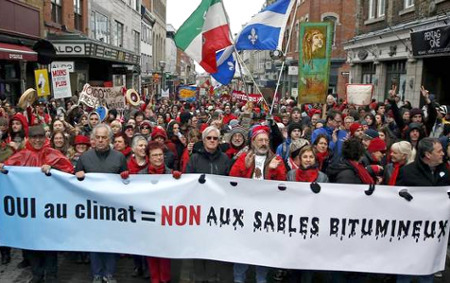 Connections were drawn between climate emergency, multinational bullying, profit imperatives of multinational corporations, compromised government agencies, bureaucratic complacency, lack of democracy, First Nations assertion of rights and settler solidarity, intergenerational solidarity, diversity of tactics, “appropriate” expression of existential angst, community empowerment and the meaning/power of collective agency. For many without deep political experience or conviction it was a formative experience to be part of this new activist community operating generally outside the disciplining of commodified and colonial space. This newly acquired awareness is now at least available to be juxtaposed to the drift that absorbs us all into habitual “normal life” – a collective lifestyle that scientists warn is inexorably leading to global ecocide. Meanwhile in the greater world, during this time period, several thousand villages in India and Pakistan were devastated by flooding. In the Lima COP-20 United Nations Climate Change Conference, the Arctic Methane Emergency group warned of “arctic meltdown: a catastrophic threat to our survival.” Climate change denying Republicans took control of the U.S. Senate in midterm elections. In Ferguson, Missouri, the governor declared a state of emergency and activated the National Guard ahead of a decision from a grand jury on the fatal police shooting of 18-year-old Michael Brown. These are a few other scattered indications of a world increasingly shaped by the interconnected issues of climate change, severe climate impacts, social unrest and a growing authoritarian state. 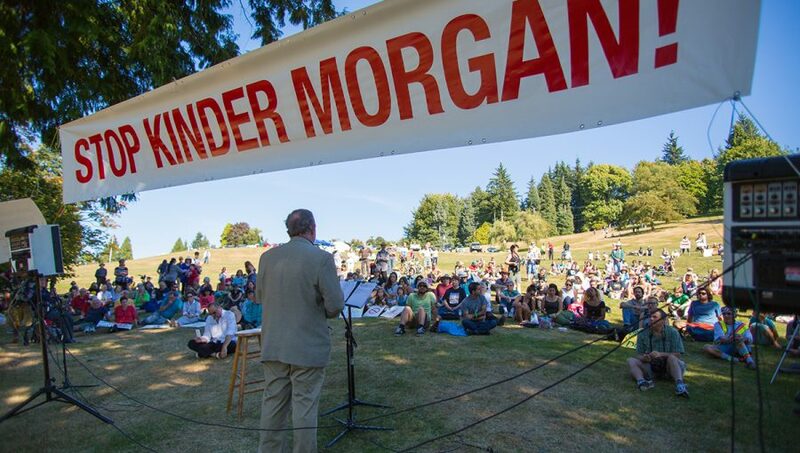 Kinder Morgan is still at work at various points in the Lower Mainland of British Columbia. For a few die-hard caretakers still on the ground, the urgent moment is still present and the object of struggle has only shifted with new tactics against the movements of KM within the Vancouver and Burnaby area. In researching the incipient climate movement, Klein realized that climate change is a wake-up call and catalyst for radical democratic social transformation; a way to persuade people to simultaneously address not just ecological but also other connected social, economic and political questions. The crisis, she says, provides both the personal affective space and the widening political and ideological space to talk about, and organize against, the common systemic basis of both the ecological and social crisis. Her book, in turn, has become an essential contribution to the movement she is documenting, inspiring a wide discussion connecting climate emergency to its socio-economic causation within capitalism. Klein explains that she wrote the book as a way out of personal doom and gloom, and a way into fighting her own depression and denial – a hesitancy about how to exercise agency amidst seemingly insurmountable odds. The book doesn’t shy away from taking on these odds, reaching toward a kind of “metanarrative” or grand theory about climate and capitalism – complete with “its great heroes, its great voyages, its great goal.” Wading through the complexities to arrive at solutions to a problem as large as climate crisis and the threat it implies (undermining of the entire earth’s life support systems) requires the type of personal affective struggle, immersion in a movement, practical confrontation with power, and sober analytical capacity that makes Klein’s contribution to this movement unique. Klein’s star power at the 400,000 strong, 2014 New York climate march is one persuasive indication of her honoured place in this movement. Positioning one’s voice at the head of this march and this movement requires a book that allows for a certain polysemy and ambivalence of meaning that is capable of rousing more diverse and broader audiences at a deeper level of engagement. Whether by design or not, Klein’s populist writing style accomplishes this to a degree through the conceptual slippage or ideological “wiggle room,” as Sam Gindin puts it, evident in its pages. At the same time it avoids the kind of ideological closure that more rigorous and precise Marxist or eco-socialist categories may engender for “untrained” audiences. Somewhere in between, spaces for constructive and strategic conversation can take place that draw on the book’s strengths. At the same time, one should not under-emphasize the negative reaction to Klein’s centrality in the climate debate, and the space that she increasingly occupies in traditionally Leftist territory. Klein is not necessarily the radical’s radical – in the world of theory or action. Since her first book, No Logo , Klein has inspired a significant degree of incredulity as the avatar of the “liberal Left.” For many activists, neither she nor any other present public figure is entirely relevant for those seriously engrossed in pushing their own activist boundaries, the integrity of which is measured by internal personal struggle rather than reflecting on outside spectacle. Writing two years before the publication of This Changes Everything, Bhaskar Sunkara argued that Klein was the product of forty years of neoliberal disorientation, the iconic “anarcho-liberal,” one who despises traditional left organizing, rejects grand-narratives and structural critiques of capitalism, is anti-intellectual, has individualist tendencies, is someone who attends World Social Forum meetings rather than Socialist International meetings and “can neither manage the capitalist state nor overcome it.” I, myself, was personally advised by a Ph.D. committee member to not mention Klein if the desire was to be taken seriously. What I would like to emphasize in this review, is that Klein’s mode of writing as embodied experience within the crisis itself grants it considerable power, and at the same time marks a departure from a problem central to both the mainstream natural and social sciences and to the relationship between the two. This is a difference between impersonal, objective observation and a kind of praxis – the street-level fighter’s interweaving of theory and practice. While there are many academic writers who have paid their dues and produced much more exacting accounts of the connections between ecology and capitalism, few can say that they have contributed so directly to a relatively consequential “movement,” (amidst the miserable dearth of North American radical organizing), whilst doing so. Part of the negative reaction from some academic corners to Klein’s book has to do with the problem that academia, by nature, is conceptually silo-ed and dispassionate. However rigorous, positivist and reductionist natural and social science, as well as policy analysis cannot pose socio-economic questions large enough to frame adequate solutions. The authoritative assertion of sound climate science, for example, might endow policy-makers with a considerable measure of influence in setting the agenda for urgent global action. But the increasingly prominent political role of climate science and mainstream policy orientations derived from it has done little to mobilize strategies on a commensurate level with the scope and intensity of the climate trajectory. This has much to do with the failure of imagination to rise to an adequate level of abstraction. What is a reasonable level of abstraction? Planetary metabolic rift has set in motion a potentially irreconcilable trajectory of bio-physical processes which, according to climate science, is either presently, or soon will be impervious to subjective human intervention. This is matched by the persistence of underlying and causal socio-economic forces (i.e. capitalism) that also appear intractable, and seem to have “life of their own” beyond intentional influence. Together, the two represent an historical crisis that is in danger of leading to final, terminal crisis of physical existence. We have already triggered abrupt changes that imply a degree of material destruction of nature, and society/nature rift, requiring renewal on a deep and epochal scale and on a more universal level than has been hitherto imagined – at least on par with the great historical shift from feudalism to capitalism. Climate science has a strong positivist dimension, but to imagine this great historical predicament in its multi-dimensionality demands an inter-disciplinary approach and activist sensibility. With its authoritative diagnosis of the state of ecological rift, climate science has been singular in its capacity to inform accurately about the state of our ecological emergency. The scientific method within the Western enlightenment tradition that is about dissecting, isolating, measuring and dominating nature, and this has led both to a trail of destruction as well as enlightenment from the “dark ages.” By accurately diagnosing biological-physical-chemical processes, climate science provides “facts” that are then, actionable. The facts also have the power to accusingly point a finger to the state of society’s ignorance and rapacity and to pose alarming questions about our state of individual consciousness. But these facts alone, if then conflated with hegemonic policy knowledges, may serve to empower the very (market) forces that are the cause of the problem, rather than help reveal the deep social and historical roots of the crisis. Any analysis of causation of the climate crisis must go well beyond the “numbers” that Bill McKibben, for instance, brilliantly leverages from the empirical evidence of atmospheric and oceanic science. Action must also go well beyond the arrests of “350.org” anti-Keystone XL activists like Klein in front of the White House, and toward social movement and comprehensive strategy. Activists must be wary of how fetishized “numbers” and “facts” that stand alone, are susceptible to systematic re-appropriation by conflation with unexamined, dominant and hegemonical assumptions or what Durkheim calls sociological “facts.” These common sense touchstones, Durkheim argues, “exist outside the consciousness of the individual,” and can have a “compelling and coercive power” that imposes normative conformance – even at sophisticated levels of academic rigour. Facts and numbers are always understood and employed within ideological frameworks. Whether the cause of climate change is said to be increased atmospheric CO2, market imperfections, or the capitalist law of value; whether present and future death rates of planetary species is best reduced by studying radiative forcing, internalizing market externalities or by seizing control of fossil fuel companies, these questions can only be decided objectively within the framework of certain methodological and socio-political assumptions. David Demeritt argues that posing theoretical constructions reproduces in an ontological sense, the world that the constructions represent or are drawn from. In each formulation, people situate themselves within systems of representations of an independent and pre-existing world; they look for solutions within that world, and indefinitely defer action toward alternative socioeconomic futures outside those worlds. What becomes important, then, is intentionally/consciously choosing which world we are immersed in. Marx’s Theses on Feuerbach is a critique of both idealism and mechanical materialism. The theme that reconciles the two – the admonition to make history while studying it – is a crucial aspect of the revolutionary formula. The notion that Klein’s book emerges out of personal and political engagement is a confirmation that “radical” analysis includes the type of embeddedness in praxis that Marx so brilliantly defined in this piece as well as in the Economic and Philosophical Manuscripts of 1844. The quality of contributions from Critical Studies or Left academia, no matter how rigorous, is problematic if divorced from the world of political struggle. It is incapable of producing a voice with the kind of cadence and rhythm that gives its messaging the “bounce” and relevance that Klein has achieved. A huge body of literature has identified the moral turpitude and irrational direction of an increasingly neoliberalized capitalism within the last forty years. Likewise, in the last couple of decades, a profoundly instructive body of new eco-socialist literature has accurately explored causative and prescriptive analysis within ecological and capitalist critique in a much more substantive way that Klein has done in her new book. But none of it has risen anywhere near the prominence and cultural status of Klein’s writing, nor has it had virtually any impact on political processes. The message from all of this is that Klein has achieved the acclaim and exposure for good reason – because her approach is a qualitatively different angle on the relationship between subject and object. One could similarly also argue that any hope of civilizational survival (not to mention new socialist political formation) will depend upon a very different level of engagement that does not begin and end with positivist approaches to knowledge and action. The epic warnings from climate science must mobilize radical traditions of social science that are immersed in sensual (affective) struggle with power. There are historical and contemporary examples of radicalized natural scientists who attempt to break the academic mold. The science/activism of James Hansen and Kevin Anderson are two examples. Both have extended their science to the political realm but neither have fully voiced and acted upon revolutionary conclusions. Klein takes the work of these two and invites readers into a deeper praxis when she frames the argument by saying that if climate science is accurate – that it is imminent, and potentially intractable and catastrophic – then there are no non-radical solutions. “What the climate needs to avoid collapse is a contraction in humanity’s use of resources; what our economic model demands to avoid collapse is unfettered growth”, she argues. The focus moves from individual and isolated elements of the picture, to the whole. It encourages movement from a focus on surface level, spontaneous response to the question of fundamentals. Likewise, activist sensibility must also move from conveniently packaged, spontaneous “solutions” to levels of abstraction outside of the immanent frame of capitalist culture in order to “change everything, everywhere.” The maturation and movement from spontaneous calculation and presentation of the facts, to searching for solutions within restricted and compromised sociological assumptions, to radical political-economic deconstruction of dominant ideology, and then to targeting and confronting the fundamental basis of power behind palpable, destructive metabolic processes – is the urgent path that must be made radically endemic in this age of crisis. If we are to establish the incompatibility of capitalism and civilizational survival as the basis for collective action, we cannot then deny the requirement of working outside capitalism to bring-on the collapse of capitalism – a revolution in the social system as a whole. Richard Smith among many others argues that Klein is rejecting neoliberalism, but not capitalism per se. We can certainly cite passages that say exactly this, but we can also find words that are explicitly revolutionary in character. If one were to compile all of Klein’s recommendations for societal change throughout her pages, one could not help but arrive at the prevailing message of where it leads is inescapable. The Right gets it, as Klein argues and so does Patrick Bond when he says of climate change and the need to confront our present system: the reforms required at all levels of society to negotiate this transition would be so momentous they would have revolutionary implications. Taking climate science seriously undermines the very underpinnings of neoliberal ideology. It also undermines reductionist and positivist approaches to dealing with the problem. Klein’s analysis is a direct challenge to the dominant narrative that has framed policy debate over the challenge of climate change. This is the framework that views greenhouse gas emissions are primarily an economic problem. According to this logic, the climate crisis that arises from increasing atmospheric concentration of emissions is a failure of the price mechanism and the market to cost the damage done. Conventional economic theory provides a simple solution: incorporate emissions into the market system by putting a price on carbon to reflect the costs of an externality by determining an emissions cap, and issue emissions permits and an emissions trading system. Other market-based disincentives – like carbon taxes – are in line with the same logic. The underlying reasoning is that pricing disincentives will magically induce behavioural change leading to a more efficient allocation of resources. By treating environmental issues as goods supplied and demanded in the market, some optimum level of pollution control will naturally follow. Neo-classical economics underpins market fundamentalism and the idea of perfect competition. If anything, Klein is overly enthusiastic about the potential of new energies and technologies. But the perfect expression of propaganda is to state half a truth as if it is the full truth. The propagandist can then undertake to undermine detractors by claiming a straw man. New technologies are obviously key, but in isolation they are a false God. God is not a nerdy technician, but one who is all seeing, all knowing. Context or “totality” is crucial. The Jevons Paradox, for instance, refers to the idea that within capitalism the growth effect will always far outpace the efficiency effect, such that increases in technological efficiency (dematerialization) only drives economic growth, or more increases in production, energy and material throughput. Increased efficiencies in exploiting natural resources only serve to generate increased demand for that resource; thus the scale of production coincides with increased profitability of industry with cheaper factors of production. Development without growth, or ‘decoupling,’ again, within capitalism, is therefore an entirely dubious prospect. Furthermore, the great environmentalist and poet Wendell Berry argues seemingly counter-intuitively that “the worst thing that could possibly happen in this world is for somebody to discover a green fuel cheaper than air. We would wear this world out in 20 years.” Fossil fuels are not the problem. The problem is the underlying socio-economic system based on limitless capital accumulation that has a built-in imperative to dig up the most polluting and easily available energy, at the fastest rates, for the lowest cost, to achieve the highest profits. More efficient technologies are an important component of a less ecologically impactful future, but simply cheerleading for the newest “breakthrough” technologies that will never fully arrive, must go hand-in-hand with fighting the real driver of devastation today – the anarchic, irrational profit-motive within an increasingly authoritarian political system. Conversion to sustainable energies and technologies, along with massive conservation, especially considering the severe timelines imposed by climate crisis, will only be successful in conjunction with other societal transformations. Classical definitions of revolution refer to overturning the existing relations of production (class and ownership) to another set of relations that benefit all. In contemporary terms this means taking power away from the 1% that controls not only the way production takes place (for instance the persistence of the fossil fuel economy) but all the other institutions and relationships in society that maintain their power. One may be interested in converting to alternative energies and promoting conservation, but this simply will not happen if the conversation about social (and power) relations is avoided. Change will not happen deeply and quickly enough by arguing that it is the right thing to do, or that through entrepreneurial innovation, increasing efficiencies or declining prices of new technologies it will create extraordinary market demand, or that government will come through by imposing their partial and feeble disincentives based on weakly mandated carbon budgets. Inevitably, revolution must be directed toward breaking the core logic of capitalist accumulation. This is defined in an abstract way in terms of transforming the market and class system by undermining the capitalist production cycle – M-C-M1. Our present system is driven by money buying the factors of production – wage labour, “free” nature and capital goods (including new labour saving and material/energy exploitation technology) – in order to create more money or profit for the owners of capital. That equation leads to everything we fight against – accumulation by the dispossession of Indigenous lands, social control, social inequality, destruction of nature, elimination of jobs, the growth imperative, etc. The only alternative is a socializing of the economy and instituting society-wide, bottom-up, democratic economic planning. 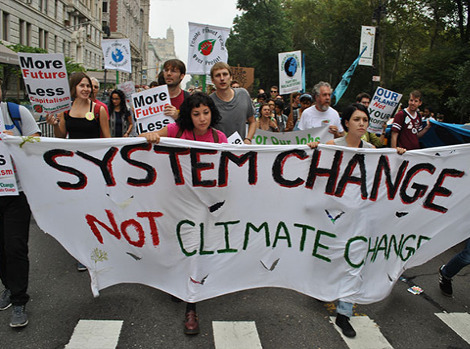 In short, the climate struggle is an issue of class struggle/war – rational planning for the benefit of all social classes rather than something imposed by a wealthy minority. In practice, one could argue that all the shortcomings in dealing with ecological and social crisis at the level of international climate talks and governmental policy are conceptual ones: the systematic framing of climate and socio-economic problems too narrowly, linearly or statistically such that recommendations of partial reforms directed to change within the whole question of earth’s productive metabolism (the entire system of production, exchange and consumption), are undermined. Klein shows how anything less than theory and action that targets multiple points of engagement to “change everything” runs the risk of irrelevance or re-appropriation as the internal logic of the prevailing capitalism system reasserts itself and undermines measures intended to control it. This logic is central to the call for a new “radicalism,” (one that is clearly distinct from “anarcho-liberalism”) and that goes past isolated struggles to create a “movement of movements” to transform the whole. The challenge for the academic Left is to take conceptual and abstract theory (such as that above) and translate it into practical “solutions,” whilst avoiding overly declaratory rigidity (dogmatic, ideological closure). The problem is the reverse as well – how to start by identifying and working amongst the real, organic movement of people and organizations who are at the nexus of planetary praxis. As the preamble to this review of Klein illustrates, good, passionate people have been led to battle with their own consciences and are mentoring the rest of us in how to embrace the optimism of the will (beside the pessimism of the intellect). New organizational forms arising in Europe, and in particular Syriza in Greece and Podemos in Spain, like many other political uprisings, display the multi-tendency and relatively organic and anarchic nature of incipient levels of organization. There is much discussion as to whether these movements represent powerful anti-systemic challenges to capitalism or will increasingly compromise as they become more institutionalized. What has stood in the way of more unleashing of this sensual involvement in planetary praxis, argues Klein (in different words), is the “neoliberal-ideological project.” At a time when the world is in most need of emotive and rational, collective action to avert catastrophe, capitalist culture has intensified its colonization of minds and communities to the point that most are challenged to think or act outside of received social norms, which themselves are increasingly contaminated by a politics of fear. The market serves as a model for structuring all social relations; personal and social life becomes isolated, individualized, competitive, thereby erasing social and ethical responsibility. Culture’s fragile stranded ethics are suspended and incapable of committing stranded fossil fuel assets to the ground. Meanwhile, on the social front, the result has been massive concentration of power within the one percent, along with untold suffering, misery, and global spread of poverty for the other ninety-nine, (see Oxfam report). We see why immersion into this movement is a large part of the thrust that empowers Klein herself to reach for the pen and what sustains her writing and the creation of a volume that, like her previous books, becomes the voice of this decade’s major concerns. It is arguable that the conceptual obstacles to prescriptive sanity/rectitude are very much influenced by the degree of affective personal and collective connection to and engagement with the victims of dominant culture. A solution to climate crisis will not be understood nor won, until larger numbers of people (settlers) are likewise engaged with Indigenous allies in direct struggle with capital at the points of extraction—as well as at the points of production, consumption and transportation. – portends intensified struggle for the climate justice movement as the forces of darkness attempt to outflank the (renewable) forces of light. There is a certain finesse to be discerned in Klein’s awkward inconsistencies and dialectical movement in her writing and activism. This is a challenge that is more than likely shared by many writers and activists: first, how to adequately relate to the world by digesting the latent elements of a large, complex and confusing reality; and then write in a manner that might capitalize on the way in which critical decoders may choose to interpret and act on polysemy of meaning. The book is full of conceptual categories with seeming contradictions. But the fact that Sam Gindin, John Foran, John Riddell, and a long line of Marxist commentators treat Klein’s work with the prominence and respect they do is a testament to Klein, as well as to the times. The best review by far is that of John Bellamy Foster and Brett Clark, two writers with credentials on the issue of ecology and capitalism that far surpass Klein’s, who move beyond the annoying minor criticisms of her work, and actively engage in celebrating and building on its strengths. This article published in Contours Journal , SFU Institute of the Humanities (Spring 2015). Jean-Francois Lyotard, The Postmodern Condition: A Report on Knowledge , Minneapolis: University of Minnesota Press, 1993. Sam Gindin, “When History Knocks,” Jacobin , 2014. Naomi Klein, No Logo: Taking Aim at the Brand Bullies , Knopf Canada, 1999. Baskhar Sankar, “The Anarcho-Liberal,” Jacobin , 10.29.12. John Foran, “Reflections on Naomi Klein’s This Changes Everything ,” Climate and Capitalism , 2014. Bill McKibben, “Global Warming’s Terrifying New Math,” Rolling Stone , 2012.
see Émile Durkheim, “What is a Social Fact?” From: The Rules of the Sociological Method , 1895 (Edited by Steven Lukes; translated by W.D. Halls). New York: Free Press, 1982, pp. 50-59.
see Richard Levins and Richard Lewontin, The Dialectical Biologist (Cambridge: Harvard University Press). David Demeritt, D., The Construction of Global Warming and the Politics of Science, Annals of the Association of American Geographers, 2001, 91: 307-337. Karl Marx, Thesis on Feuerbach , 1845. Karl Marx, Economic and Philosophical Manuscripts , 1844. Naomi Klein, This Changes Everything: Capitalism vs the Climate , Toronto: Knopf, 2014, p. 21. Richard Smith, “Climate Crisis, the Deindustrialization Imperative and the Jobs vs. Environment Dilemma,” TruthOut , 12/11/14. Patrick Bond, “From Copenhagen to Cancun to Durban: Moving Deckchairs on the Climate Titanic,” Capitalism Nature Socialism , 22/2, 2011. Fredric Jameson, Future City, New Left Review 21, May-June 2003. Will Boisvert, The Left vs. the Climate, The Breakthrough Institute, 2014. Richard Smith, Green Capitalism: the God that Failed, ThruthOut, 09/01/14. see letter by Ralph Nader to Prime Minister Stephen Harper, “Ralph Nader, What’s Happening to Canada?,” Huffington Post, 2015/02/19. Donald Gutstein, Harperism: How Stephan Harper and His Think Tank Colleagues have Transformed Canada, Toronto: James Lorimer & Company, 2014. John Riddell, Naomi Klein: ‘Only mass social movements can save us’, Climate and Capitalism, 2014. Jean-Paul Sartre (tr. Philip Mairet), Existentialism and Humanism, Methuen, London, 1948, (1973 ed).